Wormwood is the common name for Artemisia absinthium, the plant whose aromatic oil is used to make absinthe. Although absinthe contains extracts from a whole variety of different plants, wormwood oil is the key ingredient of the famed green drink, and perhaps the reason why absinthe is quite unlike any other liquor ever produced. Wormwood is a wild plant of the daisy family. Native to Europe, it can now be found in many other parts of the world, especially North America. Wormwood is a perennial plant that flowers year after year. It grows between 30 to 90 cm (12 to 36 in) tall and has small, yellowish flower heads. But the otherwise ordinarily-looking wormwood plant holds a secret: its aromatic leaves and flowers are naturally rich in the terpene thujone, an aromatic, bitter substance believed to induce an inexplicable clarity of thought, increased sense of perception, enhanced creativity, inspiration and the ability to "see beyond" -- as all the famous absinthe drinkers amongst nineteenth century poets, writers, painters and other artists discovered. But wormwood's unique properties fascinated humanity long before the plant was first used to make absinthe in 1792. Because of its powerful effects on both mind and body, wormwood has been valued as a versatile medicinal plant since at least 1600 B.C. The Egyptians used the plant as an antiseptic, a stimulant and tonic, and as a remedy for fevers and menstrual pains. In ancient Greece, apsinthos (the Greek name for wormwood) was prescribed for such ailments as rheumatism, anemia and menstrual pains, and sometimes as a means of aiding child birth. The philosopher Hippocrates even recommended wormwood as a cure for jaundice. In the Middle Ages, the plant was used to exterminate tapeworm infestations while leaving the human host uninjured, even rejuvenated, by the experience. "The wormwood wine, so famous with the Germans, is made with Roman Wormwood, put into the juice and work'd with it; it is a strong and an excellent wine, not unpleasant, yet of such efficacy to give an appetite that the Germans drink a glass with every other mouthful, and that way eat for hours together, without sickness or indigestion." To this day, Bedouin Africans sell wormwood in a Cairo market as a remedy for ill health. The Bedouin also burn wormwood leaves as incense around their newborn children to give the child a life of good health. In 1990, it was claimed that the scientific community finally recognized that wormwood extract is as good as chloroqine for the treatment of malaria. Absinthe wormwood should not be confused with so-called "common wormwood", which is just another name for mugwort. 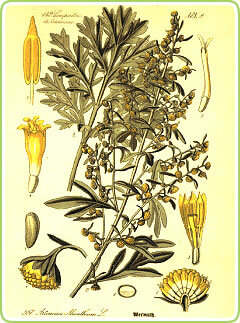 The wormwood plant from which absinthe is made is artemisia absinthium. Got something to say about wormwood? At Absinthe Fever, we encourage you to get involved. In fact, this whole site is meant as an open forum about absinthe, because we believe that absinthe is more than a drink, or a bit of thujone in a bottle. The Green Fairy -- the affectionate name given to the absinthe drink in the 19th century -- is art, poetry, experience, lifestyle... So join us and share your thoughts anywhere on Absinthe Fever! Copyright © 2006 AbsintheFever.com Contributors. The wormwood plant, a key ingredient in the production of absinthe, has been known to men since antiquity for its powerful healing properties. Wormwood, we now know, contains thujone, the substance thought to have the ability to bring the mind to a peculiar state of alertness. The Vaults of Erowid site has a section about wormwood with information, photos of the plant and even experiences by people who have "experimented" with wormwood. Wormwood tea anyone? The Golden Harvest Organics site has the recipe (the tea is to be used as a natural insect repellent, not drunk! ), plus some tips on growing and harvesting the plant. Purdue University's Center for New Crops & Plant Products has a short entry on wormwood that gives its common names, habitat and desription. Questions about absinthe answered... plus open forum. What is the history of absinthe? What are the effects of absinthe? Is absinthe a strong alcohol? How do I drink absinthe? What is "La Louche" ritual? What is an absinthe fountain?